What tyre inflators can I buy from Ebay? Buying a tyre inflator shouldn’t be seen as an extravagance, it’s an important tool to help you get the most out of your tyres and the best performance from your car. Here are is a selection of the best available from Ebay. This modestly-priced offering sold by Futura Direct is built into a sturdy steel frame and offers automatic inflation, a digital display for accuracy and a switchable light for additional illumination or attracting attention. 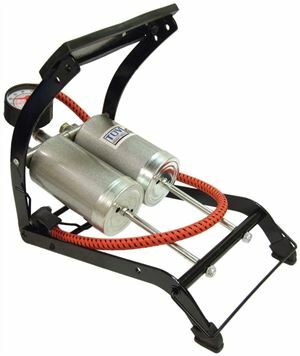 The powerful compressor can inflate up to 100PSI and dishes out 30 litres of air per minute, allowing it to inflate a car tyre in 3 minutes. 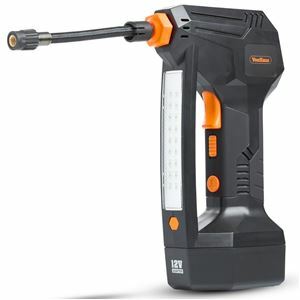 The VonHaus brand is well-known for the quality and diversity of its products and this handheld tyre inflator is a perfect example. Power comes from a lithium-ion battery allowing the unit to be operated free from cables. The battery can be charged via your car’s 12V socket or mains electricity, with additional batteries available if you need maximum portabilty. Digital operation ensures accurate pressure settings and there is also a light for illumination or warning other road users. Another excellent offering from Ring, this RAC610 model makes this list on account of the impressive low price. Simple to use and easy to understand, the RAC610 model hooks up to your car’s 12V power supply and comes with three adaptors to suit inflatables as well as vehicle tyres. 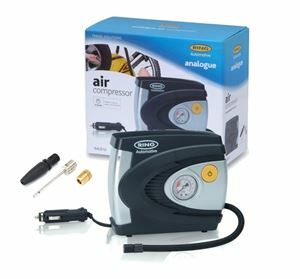 One of the cheapest tyre inflators available on Ebay, this example covers all the basics at a very low price. The twin chamber design means twice as much volume goes into the tyre for each press of the pedal, with an analogue pressure gauge reading up to a 100PSI. The air line is 24-inches in length and included are a range of adaptors to suit a variety of inflatables. 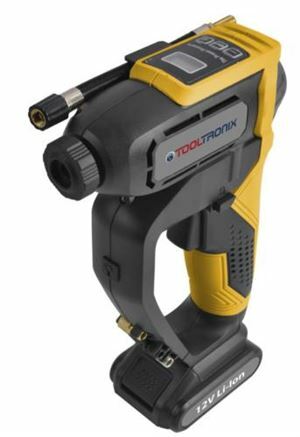 Another cordless offering, this time from Tooltronix, this digital inflator is designed to suit all kinds of situations where the freedom from sockets for power is a real boon. 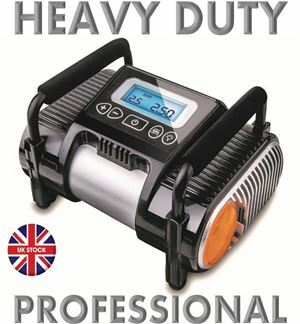 Powered by a 12V lithium-ion battery it can inflate up to 150PSI, making it suitable for larger vehicles, an the automatic operation and digital control means fast and efficient inflation. A 12V car connector and mains lead are included for battery recharge, whilst there are three adaptors included in the kit for alternative uses.